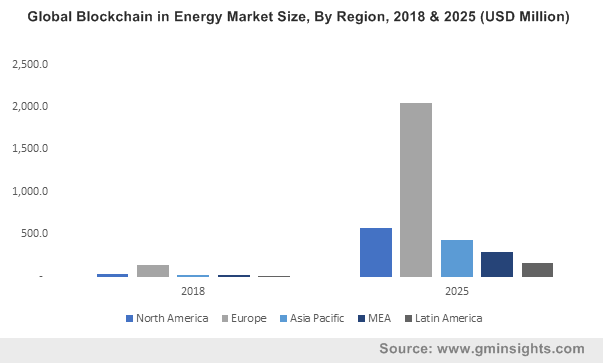 Blockchain in Energy Market size valued at over USD 200 million in 2018 and is set to grow at a CAGR of more than 50% from 2019 to 2025. Increasing complexity of grids owing to high penetration of variable distributed generation coupled with growing demand for efficient system for optimized grid operations will drive the blockchain in energy market growth. Moreover, high potential of the technology to bring positive transformation across wide range of energy applications along with enhanced focus of the utilities toward its adoption will propel the industry growth. Since 2017, nearly 140 new startups have been introduced and more than 70 demonstration projects have been planned and deployed globally. Blockchain in energy market will witness an appreciable growth on account of robust investments from various power companies along with increasing deployment of projects globally. For instance, ICOs and venture capital invested around USD 271 million toward blockchain-based applications between the second quarters of 2017 to the first quarter of 2018. In addition, shifting trends toward renewable power generation on account of its performance and price parity on & off the grid will stimulate the technology demand. Increasing demand for balancing the energy demand and supply mismatch along with rising concerns toward the security of data owing to the advancements in IoT connected devices will drive the blockchain in energy market. Moreover, the rollout of smart meters and the emergence of peer-to-peer platforms have eliminated the intermediaries, thereby creating a favorable business scenario. Emerging interest of energy utility companies in exploring the potential benefits of blockchain technology for sustainability and low carbon transition along with increased growth in the percentage of prosumers prevailing in the renewable power trading will substantially drive the blockchain in energy market. For instance, in Bangkok, residents are practicing peer-to-peer energy trading utilizing the blockchain technology and presently have an overall generating capacity of around 635 kW. Private blockchain in energy market is set to witness growth of over 45% by 2025. Ability to perform faster transactions on account of limited participants and less load when compared to its counterpart will enhance its adoption. Furthermore, higher extent of security offered by this structure along with tight control to maximize uptime will complement the industry landscape. High level of accessibility, open structure and the ability to increase platform awareness much faster are some of the vital parameters that will drive the public blockchain in energy market. In addition, the ability of public blockchains to encourage people for joining the network and authenticate transactions typically on the basis of incentives will further complement the industry outlook. Shifting trends toward digitization, decentralization and distribution along with the increasing adoption of smart and micro grids will boost the power blockchain in energy market growth. Growing propensity to manage virtual power plants or distributed energy sources along with the ability to optimize power flows via the integration of local grids will further complement the industry outlook. Increasing concerns to improve the trade accuracy coupled with technical efficiency of blockchain to accelerate access to trade data will stimulate the O&G blockchain in energy market. Extensive ability to reduce the working capital cycle and to enhance the scheduling & back-office efficiency will stimulate the product adoption across the industry. Increasing focus to eliminate the need for confirmation processing & clearinghouses along with its potential to enhance security, accuracy and speed of transactions will further stimulate the business growth. Europe blockchain in energy market will witness growth on account of government initiatives to promote & explore the technology along with accelerating investments for its adoption. For instance, in 2018, the European Commission supported the pact signing of 27 nations on blockchain, aimed at collaborating on technical and regulatory matters. Burgeoning investments from various startups along with growing number of pilot projects will drive the U.S. blockchain in energy market. Moreover, rising concerns toward data security coupled with favorable regulatory measures to implement and promote the technology will instigate a favorable business scenario across the region. For instance, in 2018, a new legislation pertaining to blockchain business development was passed, aimed at supporting blockchain business in the U.S. state. Asia Pacific blockchain in energy market will exhibit growth of over 52% by 2025. Enhanced efforts toward the implementation of renewable energy for power generation coupled with growing government emphasis toward blockchain development will enhance the industry outlook. For instance, in 2017, China announced investment of around USD 360 billion toward renewable energy by 2020 and has included the development of blockchain technology in its the 13th five-year plan. Furthermore, elimination of fraud, creation of cross-industry big data and huge productivity gains have created unprecedented synergy in blockchain platform. 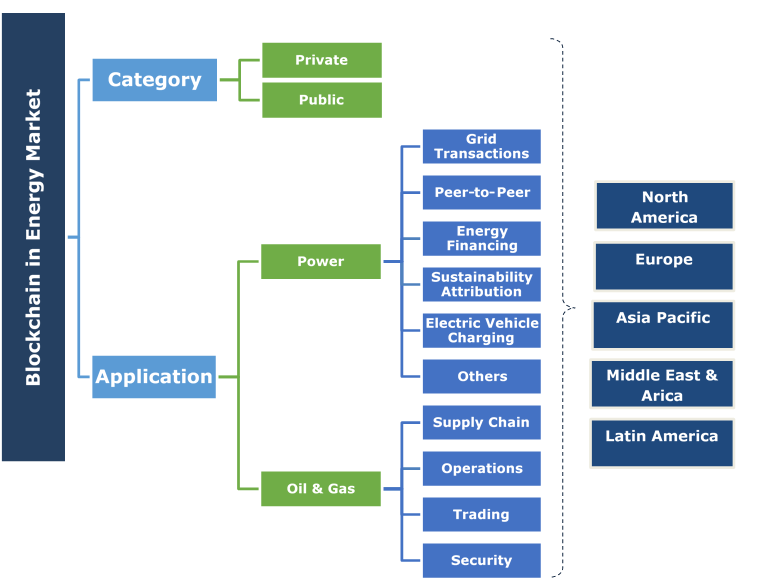 Prominent players in the blockchain in energy market include Power Ledger, Infosys Limited, Accenture, Grid Singularity, Drift, Oracle, SAP, Electron, Greeneum, Grid+, LO3 Energy, WePower, Conjoule GmbH, Sun Exchange, EnergiMine amongst others. Growing investments along with strategic partnerships & alliances has been a key strategic inference by leading industry players. An explosion of startups and the introduction of various research projects to map the relevance & potential of the technology is further becoming an integral part of the blockchain development. Blockchain technology is a digital and distributed ledger of economic transactions that eliminates the involvement of intermediaries. It is a decentralized trading platform that enables ease of transaction, accelerates disintermediation while providing unprecedented transparency and reliability in the overall transaction system. The technology offers great benefits to the rapidly digitizing power & utilities industry via creating an auditable, automated and transparent record of energy generation & consumption. It further enables energy efficient and cost-effective operations.